At the end of last year, a new book by Steve Earl and Stephen Waddington hit the shelves and caused a bit of a stir. Brand Vandals was a polemic about the dangers facing any organisation as it struggles to manage its reputation in the face of determined vandals out to destroy it on social media. Assuming you didn’t suffer nervous shock or call the emergency services after reading the first chapter, the book goes on to describe a world where luckless PR managers are fighting an ever losing battle against brand vandalism. At every twist and turn brand reputations lay shredded like coleslaw and devoured by baying, internet-frenzy mobs impervious to reason and from whom it’s impossible to hide. OK, it was a bit slapstick but the authors do have a point. Anyone remember what happened to JP Morgan when it attempted some social media engagement on Twitter by proposing that one of its top bankers take questions at the #AskJPM hashtag? Well, the PR department hadn’t realised how popular such an opportunity could be until 25,000 highly negative tweets started to get posted, such as “Can I have my house back? #AskJPM ” and “I have Mortgage Fraud, Market Manipulation, Credit Card Abuse, Libor Rigging and Predatory Lending AM I DIVERSIFIED? #ASKJPM”. Ouch. Not surprisingly, the spin doctors thought better of exposing their man to an onslaught of brand vandals and cancelled the Twitter session. Which of course made the news and looked like JP Morgan did have something to hide or worse still, felt it was guilty as charged in the court of public opinion. As they say in PR, perception is everything. With hindsight, it may have been better on balance to have gone ahead and dealt with the Q&A session in a fair and reasonable way and to have put its own side of the story. At least that would’ve helped repair some of the damage sustained to JP Morgan’s battered reputation. What the authors warn is that it isn’t the act of a disgruntled few but a well organised mob that organises itself to cause reputational damage on organisations they don’t like. A few weeks’ ago, I was teaching my class at London Metropolitan Business School about how high profile brands court the limelight through eye catching sponsorships only to find themselves on the wrong end of the spectrum of favourable public opinion. McDonald’s is a global Olympic (TOP) sponsor and has been heavily criticised for creating obesity and other health issues as a result of its products in much the same way that Coca-Cola also runs the gauntlet of criticism among parent and health groups, although it does own and promote non carbonate brands. Nike has grown to become one of the most admired and despised global brands (in equal measure) in modern times. Naomi Klein, in her polemic attack on Nike in No Logo, was a catalyst for owner Phil Knight to examine child labour practices and adopt socially responsible employment policies which didn’t exploit the poor in developing countries that manufactured his products. Over the years, Nike has been busy burying this less than flattering image and is now leading the way in how brand owners should conduct corporate social responsibility (CSR) audits. Kesper Kunde, author of Corporate Religion argues that Nike is more than just a brand – it is a ‘corporate religion’, given its strong market position, shared vision, leadership, internal-external integration and execution of its core idea – “just do it”. Even those sponsors with the Olympic halo over their head aren’t immune from the type of brand vandalism faced by lesser brand mortals. For example, at the London 2012 Olympic Games, Dow Chemical came under attack for its link with Union Carbide and the Bhopal disaster and various pressure groups campaigned against the company to have its sponsorship revoked by the International Olympic Committee. Arguably, Dow Chemical missed an opportunity to engage with all stakeholder groups by considering how it could use social media and the global audience interest in the magic of the Olympic Games to reconnect with these audiences in an appropriate, meaningful and interesting way which would have gone a long way in restoring its reputation. Instead, Dow decided to keep a low profile despite being a global Olympic sponsor. And then there’s the act of brand vandalism to top all acts of brand vandalism. Back in June 2010, Tate Britain planned to throw a gala event in order to celebrate 20 years of BP sponsorship at a time when BP’s battered reputation as a result of the Gulf of Mexico spill created a public relations disaster for the company and now looked like engulfing the venerable national arts treasure. A group of artists calling themselves “The Good Crude Britannia” campaigned to have Tate Britain cut its ties with BP and picketed the event as well as pulling off a stunt that involved spilling oil in the exhibition area, which made the national and international news bulletins. Artists came together to speak out against oil industry sponsorship of the arts in “Licence to Spill” and a news briefing was launched by Platform to coincide with the event. 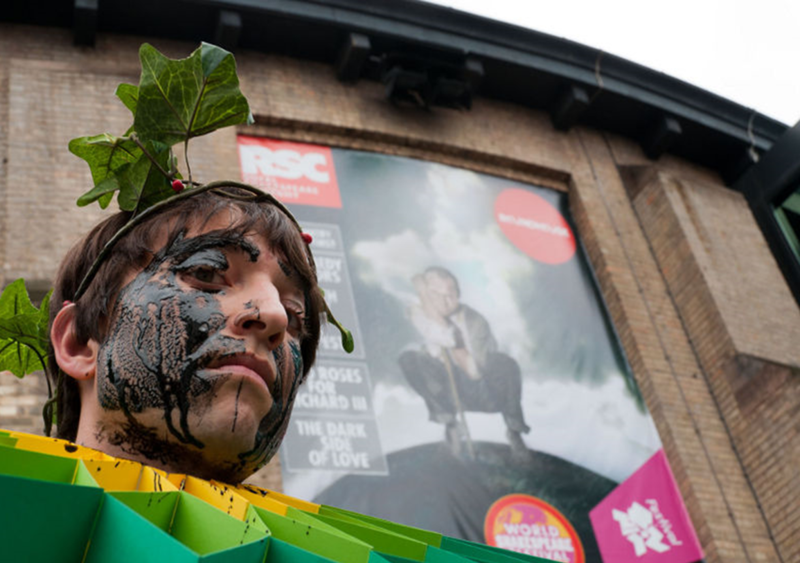 These developments came amid signs that BP sponsorship was a growing source of controversy amongst the Tate’s own trustees and staff. But that brand vandalism or disquiet amongst employees and trustees wasn’t enough to stop the sponsorship deal with BP being renewed in 2011. And as you imagine, this prompted a further wave of unprecedented attacks on the oil company and its sponsorship of the arts. Another campaign group, Liberate Tate, disrupted Tate Modern’s 10th anniversary celebrations. “Rising Tide and Art Not Oil” targeted the BP Portrait Award ceremony at the National Portrait Gallery and Greenpeace mounted an alternative exhibition to coincide with the private view. Jane Trowell of Platform explained: “BP is trying to repair its tarnished reputation and buy our approval by associating itself with culturally important institutions like Tate. The financial support provided by BP creates a perception of it being a cuddly corporate entity, and aims to distract us from the devastating environmental and social impacts of its global operations. “Public outrage over the Deepwater Horizon spill is creating a moment for change. We hope that, as happened with the tobacco industry, it will soon come to be seen as socially unacceptable for cultural institutions to accept funding from Big Oil”, she said. Tate Britain receives approximately £5m a year through its membership scheme – the largest such scheme in Europe. At the end of 2011, BP announced a £10m sponsorship scheme for four arts institutions, including Tate Britain, over five years, which would average out at £500,000 a year – a tenth of the membership revenue. Many Tate Britain trustees as well as employees of the Tate were split on whether the organisation should accept sponsorship from BP and some even resigned. Jamie Kelsey-Fry and Sunniva Taylor wrote: “Although the International Energy Agency says we must leave two thirds of known reserves in the ground in order to stay within the limits of climate safety, BP continues to spend billions of pounds searching for new sources of oil and gas, which we cannot possibly burn. “Climate scientists are in broad agreement of the need to stay below the level of 350 parts per million of atmospheric carbon to stabilise the climate. In such a situation where stakes are as high as this, it’s crucial that brands and those that they support engage in dialogue. And throughout each of these examples of brand vandalism the internet accelerated the need to respond quickly beyond all recognition, forcing a level of transparency clearly many were not ready for or actually couldn’t handle. Communications teams need sensing capabilities so that they can detect online attacks in their early stages. These sensing capabilities need to combine technology enablers with human intelligence to help gauge severity and urgency of attacks, lest the team waste efforts and time chasing “ghosts”. In addition, communications teams need to include individuals responsible for reaching out to and activating internal and external ambassadors who can in turn help disseminate key messages through social platforms. Create the internal and external ambassadors who can be activated to help respond to problems when they happen. LISTEN to Jonathan Coad, partner, Lewis Silkin and myself on this special webinar on ‘Brand Vandalism’ recorded on Tuesday 18 March by registering here.